Guinea hogs, or Guinea Forest hogs, most likely originated on the Guinea coast of Africa and were spread widely though the slave trade from Africa to England, France, Spain, and America. 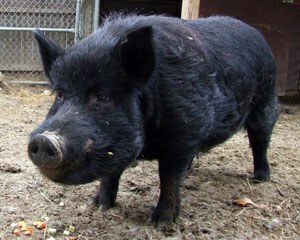 At one time they were common homestead pigs in the southern U.S., but are now practically unknown. Guinea hogs were also used for breeding with English pigs in the 1700 and 1800's and the very distant relationship between the two types made for an excellent cross.